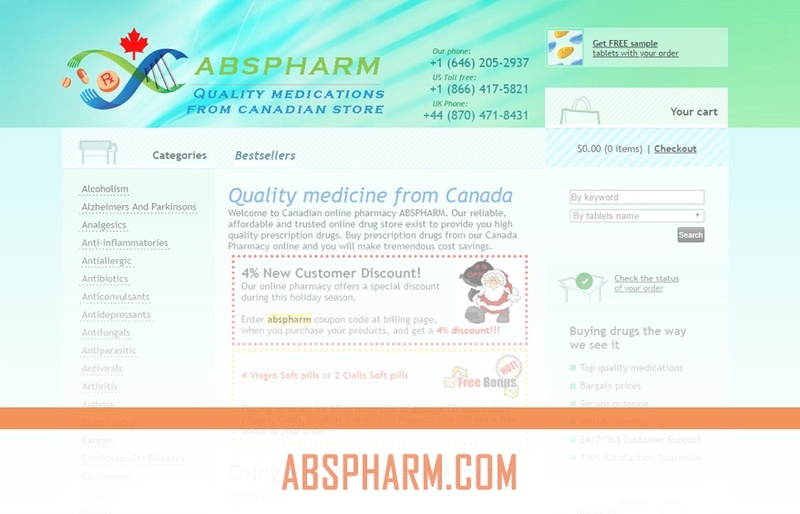 Abspharm.com was a Canadian online pharmacy that offers medication from Canadian stores (according to their tagline). The operator of this web store didn’t release any background information about their e-store. On their page, it says that the medications they offered were from India and were mostly generic versions. These were Indian FDA approved. 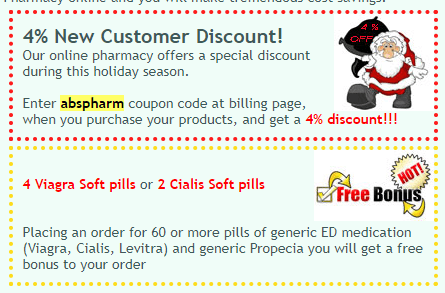 The offered medications of Abspharm.com can be found on the left side of their main page. They had it listed under different medical categories. Based on their listing, they offered medicines for alcoholism, Alzheimer’s and Parkinson’s, inflammation, depression, anxiety, cancer, diabetes, heart problems, and cancer. They also offered drugs that can lower cholesterol level, erectile dysfunction medications, pain relief, HIV, high blood pressure, and HIV among others. As mentioned, these Indian medicines were generic brands. This e-store didn’t require a prescription when selling prescription medicines. There were three ways for an Abspharm.com customer to pay an order. It can be paid with a credit card, E-Check, and bank wire transfer. Most major credit cards were accepted. All orders were backed up by a money-back guarantee and with their refund policy. During the ordering process, customers were given the chance to choose the shipping method they prefer. The two shipping methods available were Trackable Courier Service and International Registered Mail. The Trackable Courier Service costs $50 and takes up to 9 days for the order to be delivered. This can be used by all consumers except for Sweden, Finland, Austria, and Belgium. For less than $40, a customer can opt to have their order delivered via International Registered Mail and wait for it for 21 days. Abspharm offered worldwide shipping and they deliver their product in a very discreet packaging. Orders were shipped from India yet if a customer finds it unsatisfactorily, it can be returned. All orders can be canceled within the first 24 hours of ordering it. For requests and inquiries, the support team of Abspharm.com can be reached via 646 205 2937, 866 417 5821, and 44 870 471 8431. They also had a live chat support team that answered queries as well as a contact us page that customers can use to send their direct query with. The support team of this e-store was said to be available 24/7, 365 days a year. Canadian online pharmacies are known for offering low-priced medications from India. They are also known for providing the best service while some are associated with scams and fraudulent activities. For this reason, whenever we learn that we are dealing with a Canadian online pharmacy, the first thing we do is check for customer reviews. Luckily, for Abspharm.com, some third-party customer reviews were available. The first review we found was shared in 2010 by Dean. He gave this e-store a rating of 1 out of 5 stars saying that online consumers must stay away from it. He added that they sent him junk emails after scamming him and taking his money. 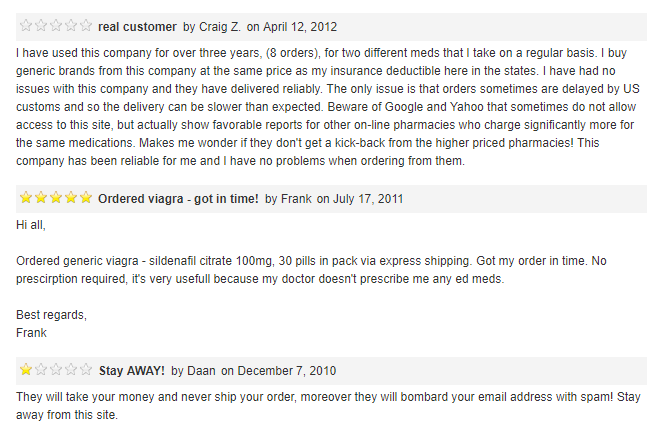 The second review we found was from an anonymous customer who ordered a Viagra. He said his orders were delivered on time and because they were not strict in dispensing Rx medicines, he was able to purchase this drug without needing to spend more for a doctor’s consultation. He gave Abspharm.com a rating of 5 stars. The last review was shared by Craig in 2012. Craig mentioned about being a loyal customer for years now. Craig said in his testimony that this e-store was reliable and the medicines they offered were good. He added that he always receives his order on time. He also warned future users to search for Abspharm.com carefully because it might not appear with Google or Yahoo search. The mixed reviews of Abspharm.com were like showing as a pattern. When they were starting in 2010, it looks like a customer find them unreliable yet as the years pass by, some customers find them more and more trustworthy. The close date of Abspharm.com is not available hence we tried to search for newer customer reviews. Unfortunately, we are unable to find newer customer reviews for this e-store. Abspharm.com had one coupon code that their customers were able to use. It was for a 4% discount. The code was abspharm. This coupon code was always released on holidays according to their page and it can be used by new customers. Aside from this coupon code, they also released a promotion wherein all orders come with free erectile dysfunction drugs (Cialis or Viagra). To qualify, a customer must order at least 60 tablets of erectile dysfunction drugs such as Levitra, Viagra or Cialis or 60 tablets of Propecia. The operator of Abspharm.com did not provide their start date on their page. This was a Canadian online pharmacy that offered Indian generic medications. They claim that these medicines they offered were safe and effective as these were Indian FDA approved. Among the promises of this e-store were quality medicines, bargain prices, secure website for ordering, worldwide shipping, a support team that is present, anytime, all the time, and a 100% satisfaction guarantee. Abspharm.com had mixed reviews from its customers. The good thing about their reviews was that it showed how they improved their service hence from having a bad review in 2010, they were able to make two customers write good reviews for them in the following years.